This is a great strategy game in which you will have to build lots of turrets in order to keep the enemies at bay. There are lots of types of enemies and each one of them as a strong and a weak point. You have to try and memorize them as fast as possible so you know what to build against them. There are four upgradeable turrets in this tower defense game but you can also spawn units that will fight the enemies hand to hand. 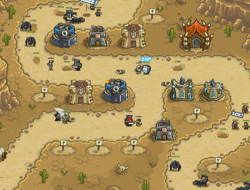 This version of Kingdom Rush is hacked so it will be much easier for you to play as you get more money from starters. Kingdom Rush Hacked 6.80 between 0 and 10 based on 5 votes.